The Donjon de Houdan (lit: Keep of Houdan) is a medieval fortified tower in the commune of Houdan in the Yvelines département of France. Constructed around 1120-1137 by Amaury III de Montfort, the keep or donjon is the only vestige of the medieval castle of Houdan. It is a massive tower isolated from the borough in the west, and is currently used as a water tower. The tower is cylindrical, 16 metres in diameter and 25 metres in height. It is flanked by four turrets 4.8 metres in diameter each at cardinal points on the central cylinder. The walls of the tower have an average thickness of three metres. The tower consists of three levels: a ground floor, and two higher floors. The interior floors and roof have disappeared. An access door was located 6 metres above the ground level and once gave access to the mezzanine floor. Another entrance was located in one of the turrets. The donjon is thought to have been one of the earliest experiments in improving flanking fire from the battlements (reduction of "dead ground"), and a transitonal form between the rectangular keeps of the 11th to 12th centuries, and widepsread adoption of cylindrical keeps in the 13th century. Other contemporary examples can bee seen at Étampes and Provins. 1903: acquisition of the keep by the town of Houdan, courtesy of the last private owner, a Dr. Aulet. This tower has never been taken during its history. Mesqui, Jean (1997). 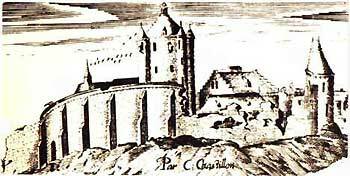 Chateaux-forts et fortifications en France. Paris: Flammarion. pp. 493 pp. ISBN 2080122711. This article incorporates information from this version of the equivalent article on the French Wikipedia.